hyla plicata, hyla pansosana, cauphias guatemalensis, cauphias crassum - high resolution image from old book. Terrier, Jules (J. T.) (1800 fl. - 1880 fl.) (DETAILS: Place of death: Father's occupation: Relatives: Education: Country of Activity: France Worked for: Louis Magaud D'Aubusson (1849-1917) , Guy Babault (1888?-19??) , Giovanni Battista Brocchi (1772-1826) , Emil Georges Dehaut (?-?) , Alfred Grandidier (1836-1921) , Edwin Ray Lankester (1847-1929) , Alphonse Tremeau de Rochebrune (1836-1905) , Nouvelles archives du Museum National d'Histoire Naturelle (Paris 1865-74) and United States Geological Survey. 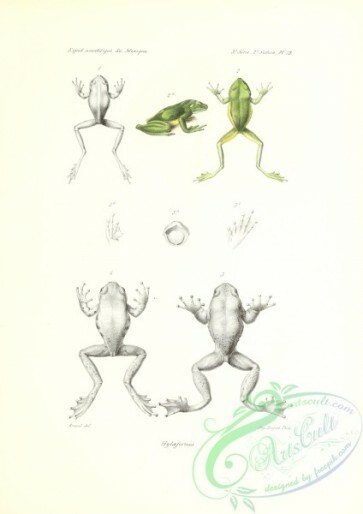 Bulletin 10 (1884) , Patronage: Collaborators: Techniques: ornithological, natural, herpetological, mammal, and zoological drawingSample(s): Archival sources: Published sources: Nissen: Zoolog. Buchillustration 1969/78 ## 155a, 178, 585, 1061, 1676, 2378, 3447, 3549, 4561 & 4795 , Other: Worked during the 20th century according to Nissen, what seems to be wrong. Further Place of Activity: United States?